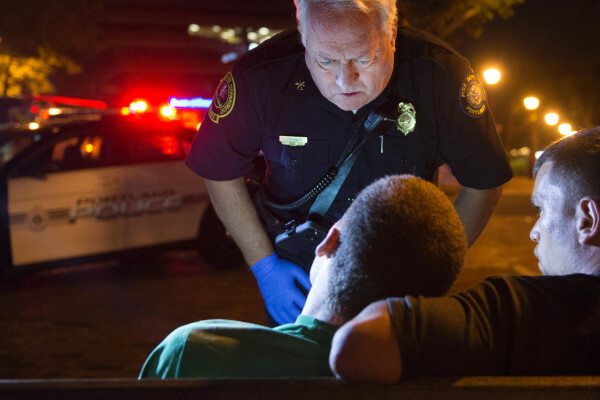 Terry Walsh, fire deputy chief in Portland, Maine, responds to a possible heroin overdose by an 18-year-old man, July 4, 2015. FARMINGTON, Maine — The local police chief announced a new program Thursday that will help get heroin addicts off the street and into programs designed to put them on the path to recovery. Operation HOPE — Heroin-Opiate Prevention Effort — kicks off Feb. 1 in an effort to combat the use of illegal drugs, Farmington police Chief Jack Peck Jr. said in a statement. The program follows in the footsteps of the “Angel initiative” started in Gloucester, Massachusetts, where police officers send addicts to recovery programs instead of taking them to jail, which recently attracted national attention. A similar program started in Scarborough last fall and others are in the works in Portland, as well as in Oxford and Kennebec counties. The treatment program will be paid for by insurance, the police chief said. “This is in response to the increasing illegal use of these drugs and the effect it has on our community. Our agencies realize that this is a deadly disease, and we want to help those who want help,” Peck said. “Addiction is recognized as a disease and one that has touched almost every person in one way or another in our community,” he added. “Officers of the Farmington and Wilton police departments as well as deputies with the [Franklin County] Sheriff’s office are aware of this disease, as they see the results of illegal drug use on a daily basis. “Please contact the Farmington Police Department, Wilton Police Department or Evergreen Behavioral Services if you or a loved one needs assistance in combating this deadly disease,” the chief said. Funding for Operation HOPE-like programs at five police departments, at a cost of $10,000, is part of the Legislature’s $4.8 million plan to fight Maine’s drug crisis.